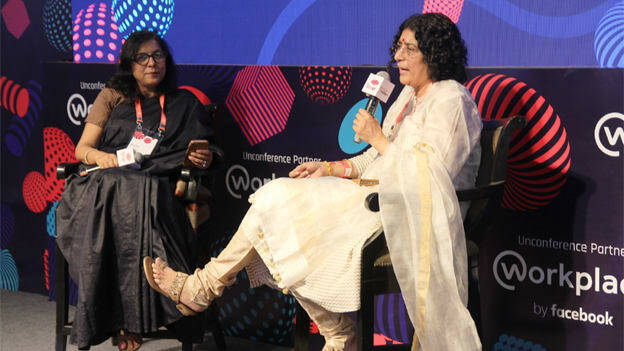 The talk show of Sushma Rajagopalan in conversation with Amita Maheshwari at TechHR 2018, highlighted the necessity for HR to have a seat in the boardrooms in reference to the future of work. “HR should have a boardroom presence” said Sushma Rajagopalan – the Managing Director & Chief Executive Officer of ITC Infotech in conversation with Amita Maheshwari, President and Head HR Star TV India in a talk show at TechHR 2018. The Talk show between the two great minds left the audience glued to their seats, while enjoying every bit of the conversation and gaining insights into various aspect of what HR must do to get a seat in boardrooms in context to future of work. Completely passionate about entrepreneurship and building a viable eco-system to promote new thinking and an innovation culture, the two industry stalwarts, feels that HR is very integral to management. Sushma’s success mantra is to ‘go with the flow’ with no stereotypes attached with the belief that anyone can become a CEO who understands the tenets of business and its financial aspect with extremely good people management skills. Here are the key highlights from this session. “A few years ago, people had to re-skill themselves once in 5 years, today it has changed to almost on an annual basis”. Up-skilling is not just about getting people to attend a workshop or a training program. A major impediment to up-skilling is making employees accept the fact that such training is good for them and must to acquire knowledge for their overall growth. With the increased pace of conducting business, organizations tend to look for ready-made talent. Embracing this change can help employees to use every opportunity to acquire the necessary skills by focusing on up-skilling every year. It is now all about stimulating life-long learning with new ways of working in context to the future of work. How do you bring the balance between grit and data? Sushma believes that a combination of human experience put together with grit and data enables people for an epic performance. As an organization grows the complexity also increases manifold. One need to supplement one’s decision-making abilities with own personal experiences. Through the assimilation of these various experiences and learning from decisions made earlier the brain scientifically gets into the mode of scenario mapping. Such voluntary and conscious methodology helps in drawing insights into what has been the follies and learning thereby helping in taking the right decision to act. And in this data-driven world, the verification process of such decisions are usually easier to derive and learn from. Such analysis helps people to actually evaluate choices more effectively. Hence, it is important to have a fine balance of both grit and data. When asked by Amita on how your organization is prepared for the future of work while it comes to managing multigenerational workforce, Sushma shared an interesting program which she had started a few years back in her organization – “Coffee and Conversation” as she feels that the future of work is not something you can put a policy on. Multigenerational workforce needs to be handled delicately by giving them what they deserve in terms of the nature of work and the value it derives. Through this initiative of Coffee and Conversation, she was able to cut across all grades of employees from the senior most employees to the youngest of graduates. This helped in enhancing self-learning in employees, fostered better transparency and then used in sensitizing employees on crucial matters that helped to bring in a good cultural change in the organization. And later this program was followed by other leaders in the company with full acceptability. Will Siri or Alexa take over HR? Sushma quickly established how the extent of automation is going to take over the way one works. Based on the economic development of the country the pace of automation too will take its own shape. This will have an impact on how the businesses will function. However, these tech tools like Siri and Alexa taking over HR is a ‘sensational statement’ as of now. Chatbots and other tools definitely have a place in the business ecosystem. The number of rising help desks are surely seen manned by all such technical tools. However, these tools and digitization is something fruitful to enhance employee experience while bringing more efficiency and can nowhere remove the human angle in HR. As HR Leaders, such approaches and guidelines may definitely help in foreseeing how the future of HR Leaders may well suit the position as the head of the C-suite table. With the advent of new age learning mechanism, proven people managing proficiencies and constant scalability to up skill with tremendous technological support, it's not a farfetched reality when one can see HR becoming more adept towards acquiring a greater role in the business system. NEXT STORY: The cost chaos!